Online shopping is easily the best thing since sliced bread, but it often means you’re overlooking local businesses in favour of the lucrative styles and low prices of huge international retailers. Luckily, we’ve found a gem of an online boutique that we’re pretty sure you’re going to love, founded and run right here in Adelaide by Courtney Rogers. Courtney spends hours a day working on her buying strategy, making sure Miko + Mollie is full of the latest and greatest pieces and posting regularly to social media to give customers styling tips and ideas on how to wear her carefully curated clothing range. The online retailer stocks coveted pieces from international Australian designers like Sass & Bide and Thurley, while also stocking smaller, more affordable brands like Hello Parry and Two Sisters, both who offer stylish pieces starting from around $60. We worked closely with Courtney to select some of our favourite Miko + Mollie stock to play around with and wear to events. The first looks we chose were quite formal, perfect for upcoming events like Red Ball or Make-A-Wish Gala Ball in May. Kristen wears the Mossman Spot The Difference Dress, a structured off-the-shoulder midi with statement bell sleeves and sneaky splits up the front of the legs. Mel wears the elegantly seductive Lexi Alektra Jersey Dress, a simple black maxi with wrap detailing around the bodice. Our next outfits made us think of days spent eating and drinking with friends, or weekends spent interstate shopping. The Premonition Posture Cami that Kristen wears is the ultimate essential black top for this summer, with a feminine v-shaped neckline and simple back draping detail. The way this top hangs means there’s no need to wear a bra, making it a win in so many ways. Mel is wearing the Toby Heart Ginger Moon Dance Midi Dress, a deceivingly light day dress. She paired it here with a belt to cinch her waist in and give her some shape and figure in this airy summer dress. When Kristen put on the Hello Parry Grace Midi Pleated Skirt in dusty rose, she knew that she could never take it off again. 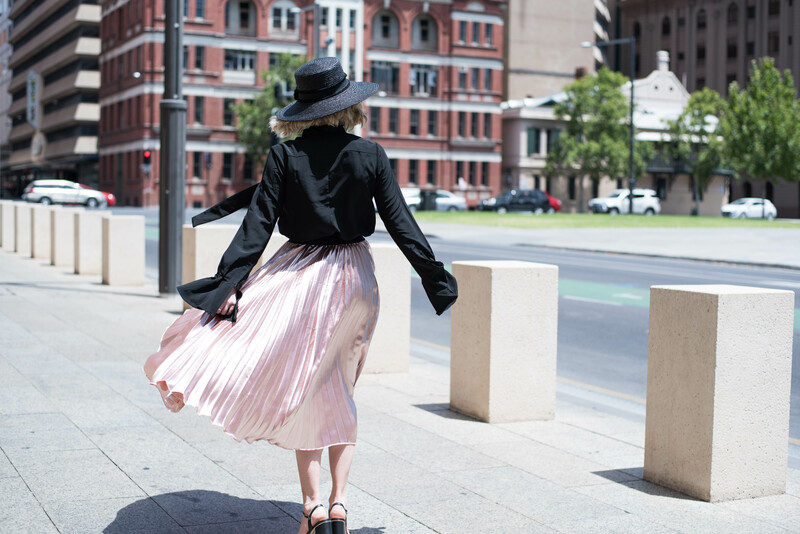 She also knew that she had to take as many spinning photos in this skirt as possible, as it shimmered like liquid rose gold whenever she moved. She wore it with the MVN Get Home Blouse, a modern take on the traditional shirt which features tiny bell sleeves and giant bow detailing. This top looks just as cute untucked with a pair of plain pants or jeans, so it’s a pretty solid investment piece. Mel is wearing the Premonition State of Grace Culottes in black, the same as Kristen in the previous photos. These culottes were a favourite for both of us, as we thought the fun, zig-zagged pattern broken up by the square lace was really unique and fun. They’re also very comfortable and flattering, and great for hot summery days as they let your legs breathe. Mel’s paired the culottes with the Toby Heart Ginger Reversible Tie Top, a multifunctional garment that can be worn with a high neck and low back as Mel has done here, or worn with the tie to the front to create a low-cut crop. If you love these pieces just as much as we do, you can shop our edit on Miko + Mollie here, or head to their full website here and use the code ADELAIDIAN20 for 20% off all full priced stock!